If you follow our tweets or have been to our sites you’ve probably noticed that we tend to talk about hand hygiene a great deal. It’s certainly the most common infection control intervention and it gets a great deal of attention as it is quite effective when performed consistently. But that’s the rub – pun enthusiastically intended. Consistency is an issue with any infection control measure. The main issue isn’t the science – that’s clear. It’s art, the art of promotion. Promotion gets staff performing hygiene regularly and even patients and visitors will do their part. 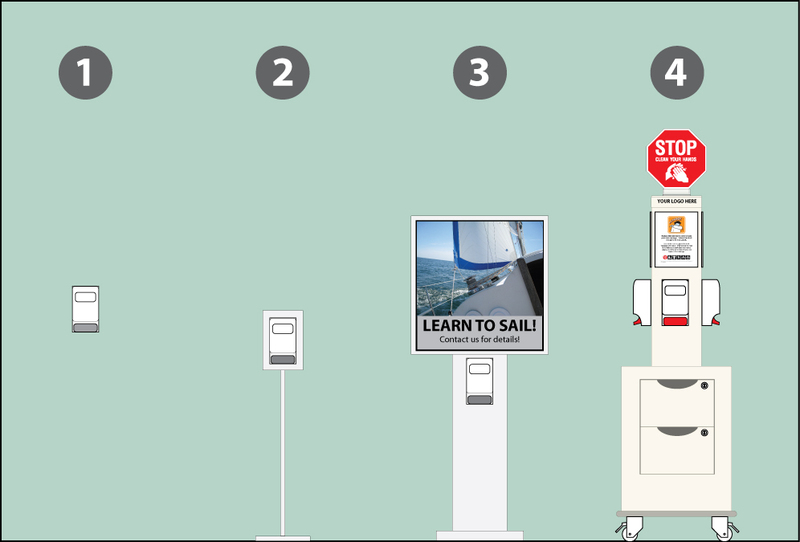 Most methods of presenting hand hygiene in a hospital environment fall far short in this department. This is the standard method for presenting hand hygiene supplies. As you can notice there is no visual support whatsoever. They do not invite use from visitors, they do not educate, and they do not attempt to draw attention to themselves. They’re just there. On the wall. People who know they’re there can use them, but there’s no incentive to do so. People who don’t probably think they’re for staff use only, if they see them at all. These were made to be cheap and thus to save on material costs they also tend to be rather small and unassuming. Because of this they are too discreet to get much attention. They are often made light and compact for portability, but because of this they tend to be unsteady and easy to topple – which is why you can only use wasteful battery-operated dispensers with these stands. Two things that are the most concerning: they have little if any room for educational material and can rarely serve more than one person at a time. Clarity and focus of message are important. Advertising fights against this for our attention. It’s counter-productive. An attempt to say “clean your hands” comes out “buy buy buy.” This is what we call a “mixed message” and it severely muddles the focus of the whole campaign. But they’re cheap! If the old adage of “you get what you pay for” holds true then these are truly a loss for hand hygiene promotion. So, what would we suggest? We first suggested this solution way back in 2005 and thankfully there are a number of Canadian hospitals that agree with us. 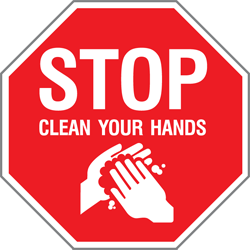 It’s simple – it invites use by all types of people (staff, visitor, MD, patient) through a sign that’s above the heads of crowds and clearly reads “Stop: Clean Your Hands.” It has a messaging area that people can read for education while using one of the (up to four) accessible hand rub dispensers. They are also stable, durable, and part of a larger comprehensive infection control communications system. Finally, its biggest strength is that it has an undivided focus on visibility, formality and inviting use. That’s just what infection control needs right now – focus. Not wishful thinking and mixed messages. ‹ Healthcare Graphics Need Help: Order, Now! 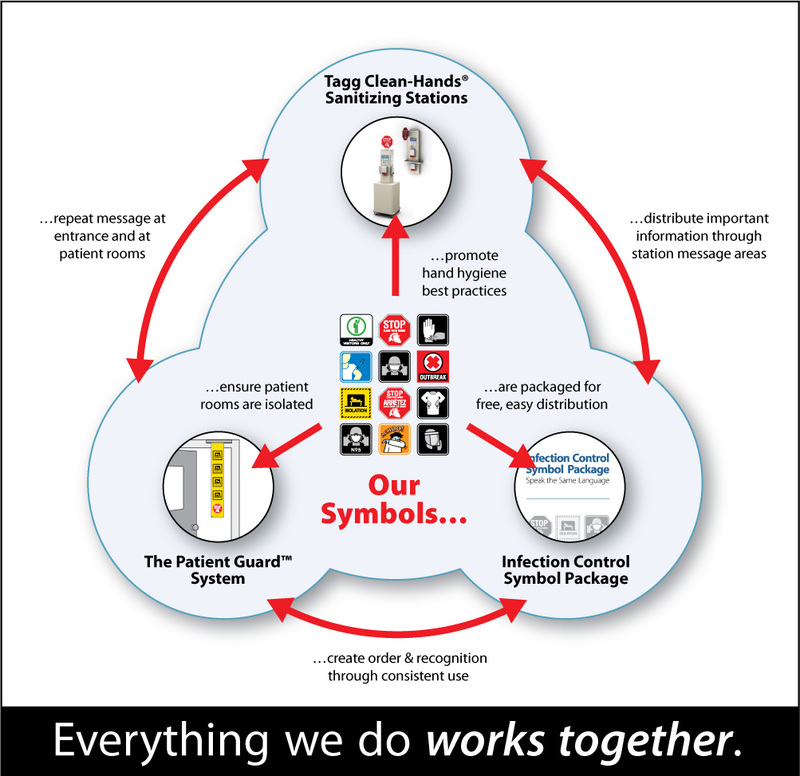 2 Pings/Trackbacks for "Healthcare Graphics Need Help: Hand Hygiene’s Visibility Problem"